Please review our attorney’s report on the Salem hearing on our state-wide initiative to amend the Constitution of Oregon to give citizens the right to local community self-government in matters that pertain to their fundamental rights. Remember, we gathered the 1000 qualifying signatures for that initiative about a year ago? At that time, the state did not authorize us to continue gathering the total number of required signatures for a state-wide initiative, arguing that our initiative did not comply with the single-subject rule, and that the matter was one that needs to bee decided at the legislative level. Oregonians for Community Rights, the political committee of the Oregon Community Rights Network, which at this point represents 6 active counties, challenged that decision in court, represented by our attorney Ann Kneeland (who also successfully represented us here in Lincoln County in the 2 lawsuits filed by Peter Bregman). The hearing was long, and there was not enough time to cover all the arguments brought by our attorney or by the State. There will likely be another hearing on the matter. What is attached here is Ann Kneeland’s report on what went on at this first hearing. We are embarked on a long educational project to raise awareness of the fact that we do have a right to local community self-government in matters that pertain to our fundamental rights, and that this right is being thwarted by pre-emption laws in which the State dictates that certain matters can only be decided at the State level, thereby overruling the will of the people, usually in order to protect the rights of corporations to pursue their often harmful projects in our communities. Our initiative in Lincoln County fits right in with the ORCRN’s state-wide constitutional amentdment effort by pursuing a BAN ON AERIAL PESTICIDE SPRAYING in our county. Aerial pesticide spraying violates our fundamental right to safety as stated in Section 1 of the Constitution of Oregon. PLEASE REMEMBER THAT OUR COMMUNITY RIGHTS EFFORTS LOCALLY AND STATE-WIDE GO HAND IN HAND. ONE BACKS AND ILLUSTRATES THE NEED FOR THE OTHER. IN LINCOLN COUNTY, WE ARE PREPARING OUR UPCOMING CAMPAIGN TO BAN AERIAL PESTICIDE SPRAYING THROUGHOUT THE COUNTY VIA MEASURE 21-177 IN THE MAY 2017 ELECTION. WE WILL NEED MANY VOLUNTEERS TO SPREAD INFORMATIONAL LEAFLETS IN ALL OUR PRECINCTS. THIS IS NOT A DIFFICULT JOB, AND IF EVERYONE DOES IT IN THEIR IMMEDIATE NEIGHBORHOOD, WE WILL BE ABLE TO COVER THE COUNTY QUITE WELL. PLEASE LET US KNOW IF YOU CAN HELP WITH THIS VERY EASY JOB OF LEAVING INFORMATIONAL LEAFLETS ON THE DOORS OF HOMES IN YOUR NEIGHBORHOOD. THERE WILL BE OTHER WAYS TO HELP ALSO, AND WE WILL LET YOU KNOW AS THE NEED COMES UP. WE WILL NEED MONEY TO PRINT LARGE AMOUNTS OF LEAFLETS TO SPREAD THROUGHOUT THE COUNTY, TO PAY FOR ADVERTISING IN THE MEDIA, FOR YARD SIGNS, FOR BUTTONS, TO PUBLISH A LIST OF PEOPLE ENDORSING OUR MEASURE, AND STATEMENTS OF ENDORSEMENT IN THE VOTER’S PAMPHLET (EACH STATEMENT OF ENDORSEMENT, AND EACH LIST OF ENDORSERS OF NO MORE THAN 350 WORDS COSTS $400). PLEASE DONATE THROUGH OUR WEBSITE DONATION BUTTON BY GOING FIRST TO LINCOLNCOUNTYCOMMUNITYRIGHTS.ORG, THEN CLICKING ON CITIZENS FOR A HEALTHY COUNTY, WHERE YOU WILL FIND OUR DONATION BUTTON. Once again, our heart-felt thanks to all our volunteers who have helped us by gathering signatures, holding house parties, and donating! We cannot do this work without you! It will take all of us to change a system that favors profits over people’s health and safety, and to leave a planet fit to live in for future generations! If everyone helps a little, we can accomplish a lot! THANK YOU!!! On April 13, 2016, the Lincoln County Circuit Court affirmed that an initiative filed by Citizens of a Healthy County banning aerial spraying of pesticides in Lincoln County is in compliance with Oregon Statutes regulating the initiative process. The initiative would also guarantee the right of local community self-government in Lincoln County in order to enforce that ban. Communities across the state face a range of Environmental harms and threats to their health from aerial pesticide spraying, building of an LNG pipeline, public water extraction, coal and oil trains, etc. By banning aerial pesticide spraying, we will be protecting our county’s soil, air, and water. Lincoln County citizens will be advancing the right to local community self-government in order to secure the rights of the people, the community, and nature to be protected against activities that violate those rights, putting their safety at risk. The initiative now faces one more legal hurdle. There is a challenge to the ballot title alleging that it is unfair and insufficient. The ballot title was drafted by the District Attorney, in compliance with regulations. Citizens for a Healthy County is optimistic that this lawsuit will be resolved quickly to allow for collection of the necessary number of voters’ signatures to place this initiative on the November 2016 ballot. The goal of Citizens for a Healthy County/Lincoln County Community Rights is to make democracy legal where we live. 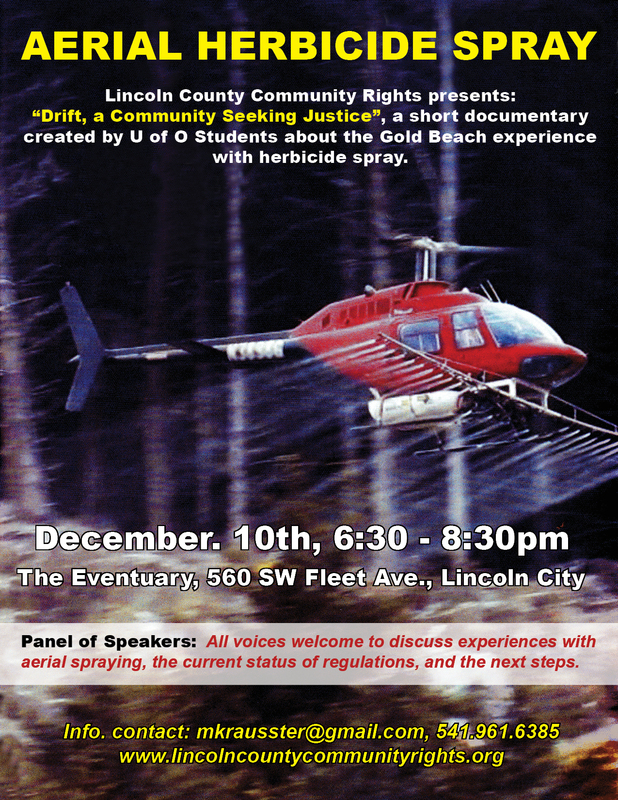 “Drift: A Community Seeking Justice” a short film created by U of O students about the Gold Beach accident involving herbicide spray of a neighborhood. This event will be held December 10th 6:30-8:30 at the Lincoln City Eventuary, 560 Fleet Ave.
Citizens for a Healthy County is seeking to change this harmful practice in Lincoln County by a Citizens Initiative filed July 6, 2015. Contact Citizens for a Healthy County by email: mkrausster@gmail.com or by phone 541.961.6385. 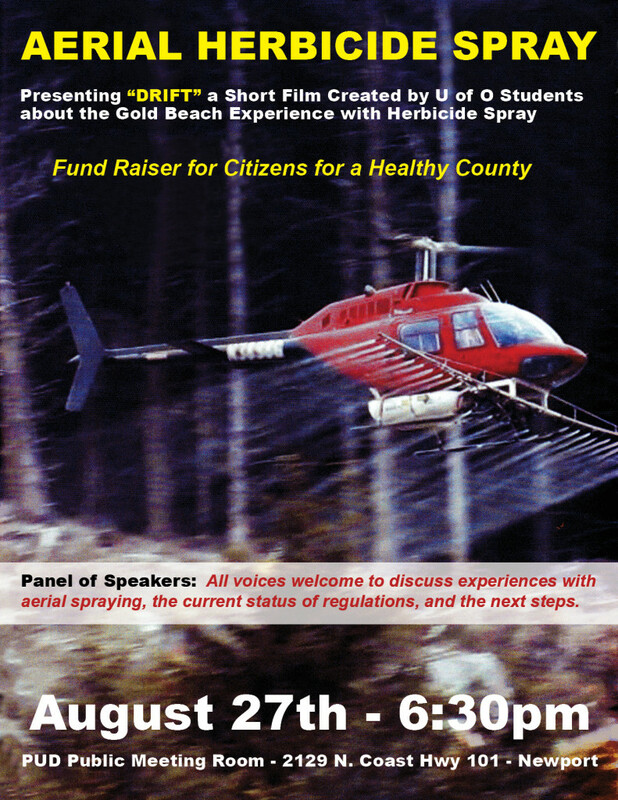 Lincoln County Community Rights has submitted an ordinance banning aerial pesticide spraying in Lincoln County. Share your thoughts, concerns, or personal stories in open conversation about its meaning and implications. The Drift Inn, 124 US 101, Yachats, Thursday, Nov. 19, 4:00 – 6:00 pm. For more information, and to e-mail us your RSVP, please call 541 961 6385; write mkrausster@gmail.com; Please visit our website at lincolncountycommunityrights.org.